No-Mar manually operated temporary sheet metal fasteners instantly spin up or down with the flick of a finger and require no pliers or installation tools. No-Mar manually operated temporary sheet metal fasteners have a specially designed tip that provides maximum gripping strength and are ideal for close tolerance positioning of thinner layers of material. No-Mar manually operated temporary sheet metal fasteners feature a No-Mar plastic cap and are color coded for easy identification. No-Mar manually operated temporary sheet metal fasteners also known as skin pins, are widely used in the manufacture and repair of aluminum-skinned aircraft and in automotive repair, where it is used to temporarily fasten multiple sheets of material together before the pieces are permanently joined. 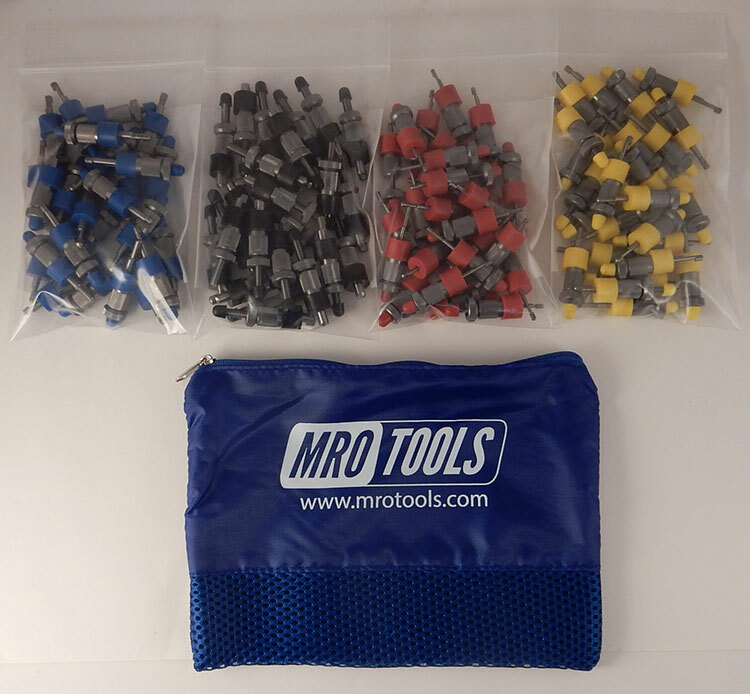 The SSL4S100 No-Mar Sheet Metal Fasteners 100 Piece Kit w/ Carry Bag is one of thousands of quality tooling products available from MRO Tools. Please browse No-Mar Sheet Metal Fasteners for tools similar to the SSL4S100 No-Mar Sheet Metal Fasteners 100 Piece Kit w/ Carry Bag. SSL4S100 No-Mar Sheet Metal Fasteners 100 Piece Kit w/ Carry Bag description summary: No-Mar Sheet Metal Fasteners 100 Piece Kit w/ Carry Bag. Color: Yellow, Red, Blue, Black Diameter: 1/8'', 3/32'', 5/32'', 3/16'' Drill Size: #30, #40, #20, #10 Grip Range: 0-1/4'' Quantity discounts may be available for the SSL4S100 No-Mar Sheet Metal Fasteners 100 Piece Kit w/ Carry Bag. Please contact MRO Tools for details.